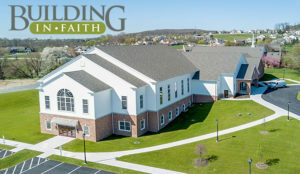 Brick Lane Community Church in Elverson, Pennsylvania, recently began worshiping in their beautiful new sanctuary. This experience was far beyond their initial vision of simply removing one wall and expanding their former sanctuary space. While considering all the needs that congregational growth had created, leaders realized that a much larger vision had to be embraced. In faith, members agreed. But this greatly increased step of faith also represented a much larger budget than was originally imagined. The congregation was challenged to contribute sacrificially, along with employing creative ways of planning their giving. Members considered not only the amounts of cash they could commit but the possessions they no longer needed or used. Some donated land they were not using. Others sold equipment and other valuables they had stored away. The non-cash items played a significant role in helping to reach the campaign target. Together, the members of Brick Lane Community Church exercised a level of stewardship that extended beyond paychecks and bank accounts to all the things with which they had been blessed. The end result was a job well done.